There are two main goals to be achieved when it comes to treating sleep apnea. First, to establish adequate ventilation. When you stop breathing your ventilation system stops. Second, to make sure your body gets enough oxygen. There are three ways to treat the problem. Each treatment method has advantages and disadvantages. The treatment involves behaviour modification, medical treatment and sometimes surgical treatment. For mild cases of sleep apnea, the treatment often starts with behavioural therapy. Counselling for behavioural changes includes losing weight and avoidance of alcohol, sleeping pills and sedatives. These pills relax throat muscles, contributing to the collapse of the airway at night. Most patients snore sleeping on their back. These patients should be asked to train themselves to sleep exclusively on their side. One way to do this is by sewing three or four tennis balls at the back of an old shirt. Wear the shirt when you go to bed and you will never sleep again on your back. It will be painful. It works and it is cheap. This can prevent the tongue and palate from falling backwards in the throat and blocking the airway. The medical management of sleep apnea uses continuous positive airway pressure (CPAP) or dental appliance. 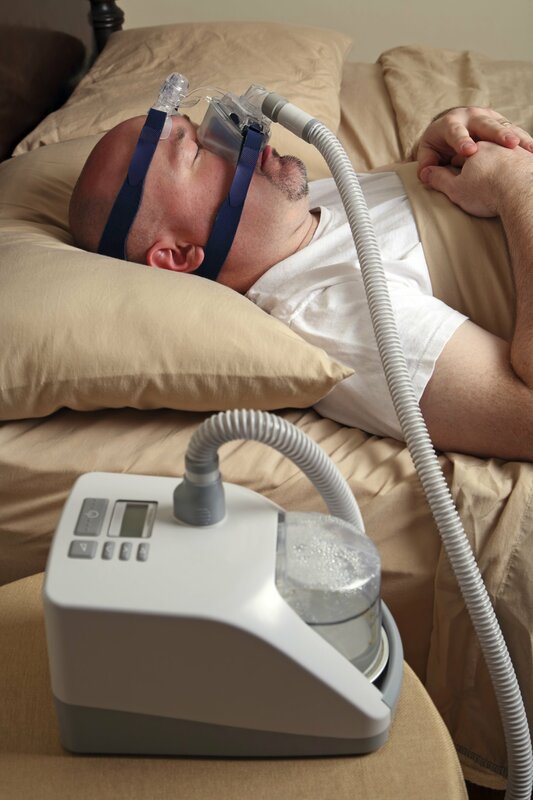 For moderate to severe sleep apnea, the most common treatment is the use of a CPAP. CPAP is delivered through a mask to be worn when a sleep. 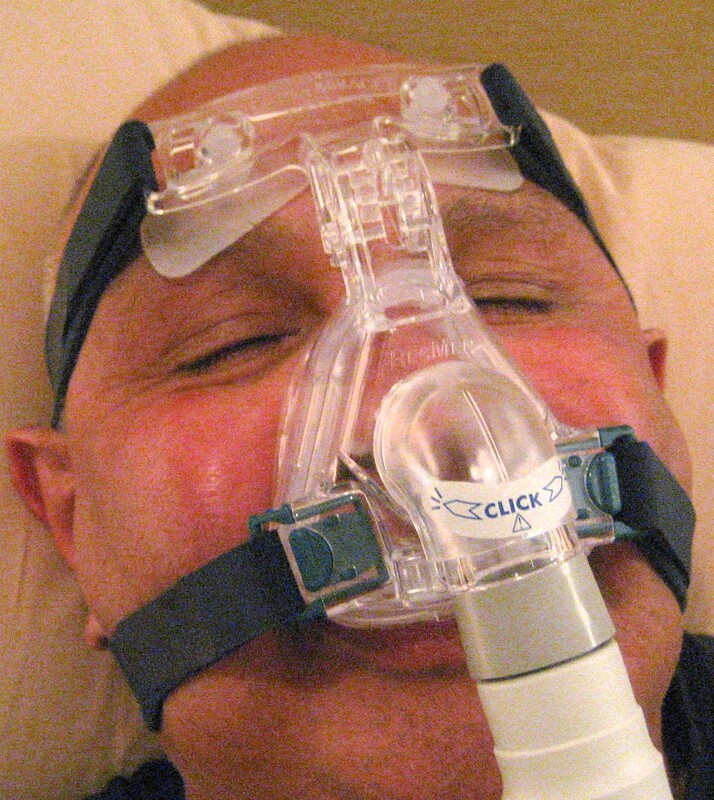 CPAP keeps the patient’s airway open during sleep by means of a flow of pressurized air into the throat. The patient wears a plastic facial mask (see picture), which is connected by a flexible tube to a small bedside machine. The CPAP machine generates the required air pressure to keep the patient’s airways open during sleep. The machine can humidify the air and keep it warm. CPAP therapy is extremely effective in reducing the episodes of apnea. But some patients find it uncomfortable. The mask is not easy to fit your face and it is not easy to sleep with. One study demonstrated 46 per cent of patients used CPAP for more than four hours per night for more than 70 per cent of the observed nights. Others have adapted to CPAP quite nicely. Some studies have shown improved survival in patients who use CPAP. Oral dental appliance has been promoted as a useful alternative to CPAP. It is a custom-made mouthpiece that shifts the lower jaw forward, opening up the airway. There are a variety of appliances. The appliances are worn only during sleep and are generally well tolerated. Not all patients have clinically proven response. It is considered as a second line of treatment compared to CPAP. Surgical treatment for snoring and obstructive sleep apnea has become quite popular. Probably due to the inconvenience of CPAP and oral appliance. Surgery is considered if only other methods fail. Several surgical procedures are available, each one with advantages and disadvantages. These procedures are done by Otolaryngologists (specialists in ear, nose and throat surgeries). There isn’t one solution to the problem of snoring and obstructive sleep apnea. Weigh your options carefully. Have yourself checked out at a sleep clinic and talk to a specialist in sleep disorders. Until then happy snoring. Risks and benefits of using melatonin for a good night’s sleep.October 30, 2018In "Medicine Hat News"
Heavy Snoring Can Be A Danger SignApril 17, 2018In "Medicine Hat News"
A Dangerous Trio – Snoring, Sleep Apnoea and High Blood PressureJuly 25, 2017In "Medicine Hat News"